While finances are the lifeblood of your business, payroll is the lifeblood for your employees. Employees will most certainly have questions, concerns and keep a close eye on their paychecks. They will want to know when changes could be coming and how they will impact their paycheck. Constant questions can impact payroll productivity, causing distractions and leading to problems. Here are two ways to boost productivity and reduce the distractions in payroll. 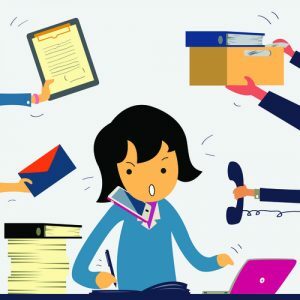 Is Your Payroll Team Overworked or Distracted? Ask that question to your payroll team and you could get some interesting answers. Processing payroll can certainly be challenging and complicated, especially when there are multiple locations, an increase in employees and many other variables. But that’s not all. Your payroll team is also regularly providing employees with important information and answering any number of questions. This can be a time-consuming process, which distracts the payroll team from other important tasks. With each question, your payroll staff needs to stop what they are doing, look up information, then get back to an employee with an answer. These constant distractions are a burden on productivity, not to mention frustrating. Many payroll complications can be corrected with modern technology. Users of Microsoft Dynamics GP can add these two powerful, affordable solutions to boost payroll productivity and reduce distractions in the payroll department. Stop the paper chase: Replacing paper processes with more modern automation is sure to save valuable time. Your payroll team can use the Employee E-Mail Suite to email direct deposit earnings statements, W-2 and 1095-C statements and any number of other company documents or notices. Instead of printing and stuffing envelopes, not to mention paying for postage, your payroll team will save hours of time sharing important documents and information with employees via email. Skip the middle man: Employees will have questions regarding their net paycheck, especially when they anticipate changes to exemptions or deductions, insurance, pay rates or other variables. Instead of interrupting one of your payroll staff, allow employees to evaluate changes using the Paycheck “What If” Calculator through Dynamics GP Self Service. Employees can make hypothetical changes to pay variables, and answer their own pay modeling questions, without impacting the master record or distracting your payroll team. Employees rely on you to provide accurate paychecks just as much as you rely on them to perform their jobs. Productivity is essential across the enterprise, including your payroll department. Employee E-Mail Suite and Paycheck “What If” & Gross-Ups Calculator are two of many powerful add-on solutions that can improve the payroll posting process. Contact Integrity Data for help identifying complicated payroll processes and deploying the technology to streamline them.